When struggling with a difficult task, students face a choice: give up or take on the challenge and persevere. High schools strive to ensure that students are able to overcome difficulties through an understanding that their abilities and intelligence are capable of growth. At Bronx Leadership Academy II (BLA II), a high school serving overage and under-credited students in the South Bronx, teachers are working together to support productive struggle in the classroom. 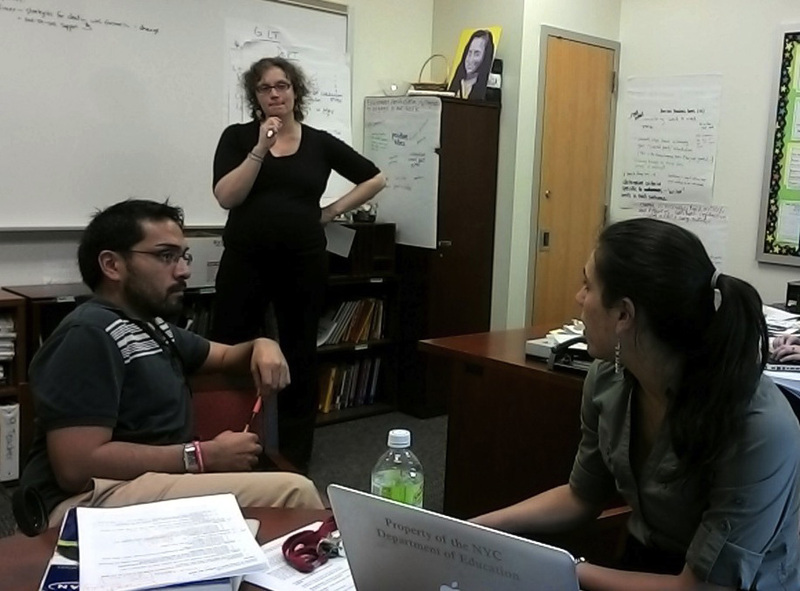 As part of the NYCDOE Academic and Personal Behaviors Pilot, Rosa Moshi, a third-year biology teacher, and Robert Trujillo, a second-year math teacher, developed practices to help students reduce their fear of making mistakes and begin to see those mistakes as valuable opportunities for learning. With support from Eskolta, the team has modified classroom practices to help students develop growth mindsets. Beginning in the fall, Eskolta Senior School Developer Alicia Wolcott met with the Academic Behaviors Pilot team in a series of monthly meetings. During these facilitated sessions, the team developed growth-mindset practices to test out and build on during the pilot. The group also worked with Eskolta Research Analyst Amanda Crowell to review the data they collected and use these insights to brainstorm and strategize small changes that were made to classroom practices each week. Ultimately, Rosa discovered that her students needed concrete strategies to guide them in their work outside of the classroom. Communicating growth-mindset ideas to the class, she established a list of techniques for active studying and created a log for students to fill out each time they studied outside of class. By complementing growth-mindset attitudes with ways for students to engage in effective effort, Rosa began to see positive changes in how her students responded to challenges. As part of the project’s design, Rob chose a different practice to explore. He began by giving feedback with growth-mindset messages on assignments. Through data collected on completion of in-class assignments, he found that his students finished the most assignments after he personalized his feedback. Thinking a more structured approach could be beneficial, he introduced individual conferencing using a Persistence Rubric to help students review their progress and to set and meet weekly goals. He began to see a change in student attitude, citing one example of a student who initially shut down when faced with challenges: “He’s come a long, long way from when we first started—he’s attentive, he’s taking notes, he’s asking these questions that let us know that he’s letting his mind wrap around these concepts in a way he never would have done before. Before, he would have said, ‘I’m not going to do this…’ He doesn’t really do that anymore.” Now the Academic Behaviors Pilot team is brainstorming how to expand their practices throughout the school. Both Rosa and Rob are planning to share and extend the growth-mindset practices to multiple grade levels in their departments next year.